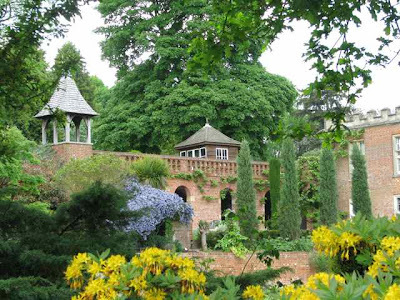 Delightful gardens beginning with "D" and "E"
Delightful gardens beginning with "D" and excellent gardens starting with "E" are featured here today, starting with Denmans Garden in West Sussex (below) - created by well-known designer, John Brookes. 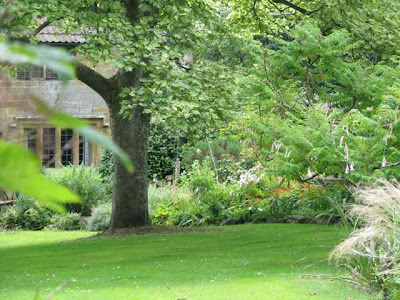 This garden is a secluded paradise and is home to many fine foliage plants, which provide year-round interest. The planting here is luxuriant and you feel that the site is much bigger than its four acres, because there are so many different species. 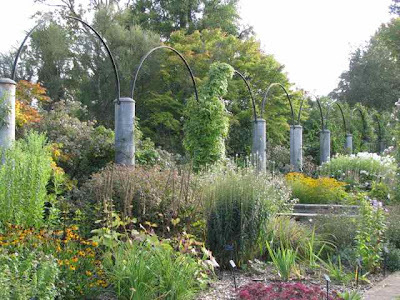 An added attraction here is that the garden is open all year and has a wonderful nursery. Dyffryn Garden in Wales is worth making a detour for because of its fine borders, interesting statues and series of themed garden rooms - also open throughout the year, so there is always something to see. There are deep herbaceous borders in summer; croquet lawns fringed with Irish yews; a rose garden; fernery; Mediterranean and Pompeian Gardens; and all set against the backdrop of a house built at the turn of last century. The original garden was designed by Thomas Mawsom, and with the help of recent lottery funding, much of the garden has been restored to its former glory in the last decade. East Lambrook is a must if you like cottage gardens. Former home of Margery Fish, who is synonymous with "cottage gardening", it embodies the seasonal English idyll's of snowdrops, spring bulbs and masses of summer colour in a small space. You will see every type of cottage garden flower here and the winter snowdrop and hellebore displays are quite spectacular! 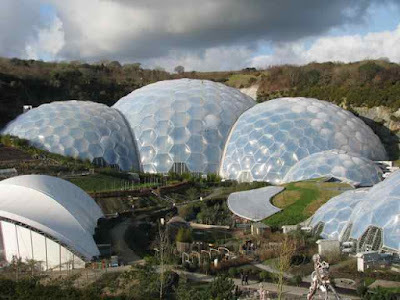 The Eden Project - which breathed new life into Cornwall and put the county back on the map -you'll never forget the first view of the biomes (below) as you stand at the top of the hill looking down. It's not everybody's cup of tea and you could be forgiven for thinking that you've landed on Mars when you arrive, but certainly worth a visit, even if only to say that you've been there. The different biomes house plants - divided into different geographical areas and offering humid tropical species and Mediterranean plants. With over 1,000,000 visitors a year, they're doing something right here! Englefield House, a classical masterpiece, and a garden that has been there since the 17th century, complete with deer park, lake and formal gardens. There are stone balustraded terraces adjacent to the house and miles of parkland to explore - particularly spectacular in spring with the azaleas and all the bulbs, stretching as far as the eye can see! All these gardens are open throughout the winter months, but do check websites for open days - Englefield House (above) is only open on Monday during the winter months! It is really a nice collection. 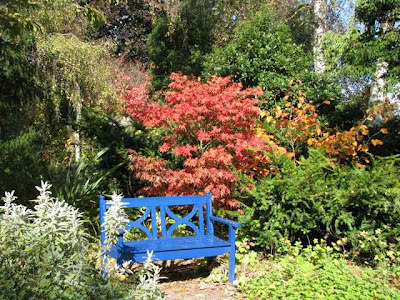 The blue bench is the exact color that I painted my two garden gates. I have seen stories about the domed gardens. Our pbs garden shows like to visit over there once in a while. Thanks for sharing. Please, please, please can I go? One, all, any! Wonderful post, I am crazy about the blue bench. I loved Eden. That was my birthday present this year! Charlotte, I am getting very excited, you are getting close to the letter for two of my favourite gardens, The Grove and The Laskett. I do hope that you have something about them. Englefield House in particular sounds like a gardening paradise! Pretty exciting to see such delightful gardens. You do exceptional garden photo essays. Love them! Lovely I always enjoy seeing your garden trips. I am not a fan of Eden to much like a theme park for my liking but I loved Margery Fish's garden.